This image shows the Philae lander's possible future landing site, called "Agilkia," on Comet 67P/Churyumov-Gerasimenko. Image taken on Oct. 30, 2014. A probe chasing a comet is about to make a daring attempt to land on its deep-space target, and now, the robot's landing site officially has a name. "The decision was very tough," the DLR German Aerospace Center's Felix Huber, chairman of the Philae Lander Steering Committee, said in a statement. "We received so many good suggestions on how to name Site J, and we were delighted with such an enthusiastic response from all over the world. We wish to thank all participants for sharing their great ideas with us." The goal of the $1.6 billion (1.3 billion euros) Rosetta mission is to learn more about the science of comets. Scientists are also interested in researching what comets might reveal about the way life evolved in the solar system. Officials chose the landing site because it has some smooth terrain, and could be the safest area to set down the probe. While many people suggested Agilkia as the landing site name, ESA officials chose Alexandre Brouste of France as the winner of the competition. Brouste will get to watch the live landing event, expected to take place on Nov. 12, from ESA's Space Operations Control Centre in Darmstadt, Germany. "In eight days' time, Philae will be deployed from the orbiter onto Agilkia," Fred Jansen, ESA Rosetta mission manager, said in the same statement. "On 12 November, we'll be attempting a unique comet landing, an even more ambitious endeavor to unlock secrets of our most remote origins." 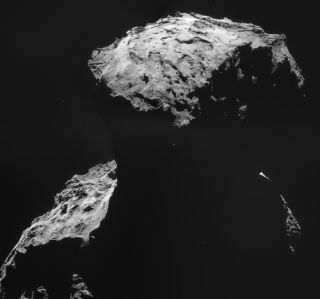 If the landing succeeds, it will be the first time humans have ever successfully soft-landed a probe on a comet. Philae will use its instruments to study the comet from the surface while Rosetta studies it from the comet's orbit. Rosetta is set to release Philae down to the surface of Comet 67P/C-G on Nov. 12, when both spacecraft are orbiting the comet at about 14 miles (22.5 kilometers) from its core. The two probes were launched on a 4-billion-mile (6.4 billion kilometers) journey through space in March 2004.